Was Michelangelo a Clematis Personality? Often, when we hear about the private lives of very creative, artistic individuals, we hear that they were not very much "with it" in regard to their daily interactions. Some were thought of as eccentric or hermit-like. People marveled at the fact that humans who behaved in such odd manners could create such beauty. The reason is that they were probably Clematis personalities. In the negative Clematis state, people seem to tune out the real world around them and live solely "in their heads." They have little enthusiasm for either the good or the negative events in others' lives. In fact, they have little enthusiasm for their own lives. They simply aren't much interested in the physical world. Doctors find them hard to treat, because they don't possess much instinct to survive. They aren't suicidal, they just won't mind if they die. Unless allowed to be in a position of creativity, the Clematis person will retreat farther and farther into himself, preferring to sleep as much as possible. After treatment with the Bach Flower Essence Clematis, this person will find renewed interest in the physical world, and will use his creativity to contribute greatly to those around him. He'll be vigorous in bringing his creative dreams to life, as a painter, a musician, a writer, a designer, etc. Are You Pulling Yourself in Too Many Directions? Sometimes, it seems like life hands us too many responsibilities at once - or maybe we just take on too many responsibilities. Either way, the pride we once felt in "multi-tasking" can turn into a burden that makes us feel like we're not only pulled in too many directions, we're being pulled apart at the seams. Elm is the Bach Flower Essence that can help bring it all back into balance. Elm helps nurture sound decision-making skills - allowing us to put things in their proper order, and eliminate tasks that really don't need to be our responsibility. People in the negative Elm state tend to forget that our primary responsibility is to ourselves. As a result, we can get so busy taking care of everyone else that our own health and mental state suffer. With a little help from Bach Flower Remedies, we CAN get organized again, pull our scattered pieces back together, eliminate unnecessary tasks, and allow ourselves to relax and enjoy the fruits of our labors. 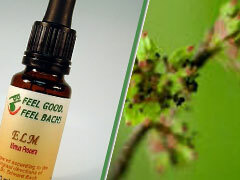 If you've fallen into a negative Elm state, visit www.bachflower.org today and learn more about the Flower Essence Elm. Then get started on taking your life back! To learn more about Dr. Bach and Bach Flower Essences, visit www.feelbach.com. Are You Frightened of Public Speaking? Most people who are afraid of public speaking avoid it at all costs. But once in a while, there's no way to get out of it. I remember a required class in college - I forget the name of the class, but one of the requirements was giving a speech of sorts in front of the class about 3 times during the semester. We had a deadline for "being ready" and then didn't know who would be called each time we went to class. As a result, I went to class every day with a cold lump in the pit of my stomach - terrified that that would be the day. I remember feeling like I could hardly breathe when I got to class. I got through it, of course. And since then I've learned to speak in front of a group without the terror, but I wish I had known about Bach Flower Essences back in those days. If you're facing that kind of situation, the Bach Flower Essence you need is Mimulus. This Bach Flower Remedy treats all types of fears and allows you to face life's challenges with will-power and determination. It won't make you enjoy public speaking, but it will allow you to face it without the fear. If you're new to Bach Flower Essences, visit Feel Bach! to learn about Dr. Bach, and how Bach flower essences can help you - both emotionally and physically.